In coming home by some cherry trees that stood near the fence, Samuel saw a little animal, larger than a bat, fly swiftly from one branch to another. He asked his cousins if it was not a flying squirrel. Thomas answered, "Yes. Several nests of them are in these trees. If you could examine one of these squirrels closely, you would see that its wings, as they are called, are not like bird's wings." "They seem more like a bat's wings," said Samuel. "So they are," replied his cousin; "only thin skins, stretched along the sides from the fore legs to the hind ones. But these squirrels cannot fly far, nor stay long in the air, as bats can. They merely dart swiftly from one branch to another." "What other kinds of squirrels are there?" asked Samuel. "The grey squirrel," said Thomas, "much larger than this one. It is not often found about here. Then the ground squirrel, that lives in the ground, instead of on the trees. The common squirrel, such as you see running about the fences and woods; and two or three other kinds. Some people eat squirrels; but I have never tasted one." Have you enjoyed Samuel, Thomas and John's stories? Our kids plays are stories about children just like these boys. Well, they're more than stories, really. Not only do you get to read the adventures of kids just like yourself, but you can act out their story. You pretend to be that story person. It's great fun! 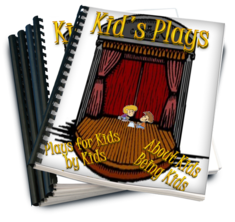 Plus, you’ll find a total of 6 great plays in this fun collection.